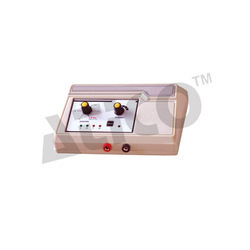 Providing you the best range of muscle stimulator (therauptic) with effective & timely delivery. Muscle Stimulator is advanced equipment that uses low voltage for targeting motor nerves to stimulate them. Due to the shock the muscles get relaxed and contracted. Thus, this continuous contracting and relaxing is used to treat various vascular and musco-skeletal conditions. Pulse Duration (Galvanic): 30~300 ms Variable.